I spent a good part of yesterday doing one of my favorite things: trying to read the tea leaves on the emerging trends in evangelicalism. (Because of this, I turned on the soccer game about 22 minutes late which meant I missed the match!). It was an interesting day. I read a little of Soong-Chan Rah’s The Next Evangelicalism and considered his take on Western Cultural Captivity. I watched a great discussion on Ed Stetzer’s The Exchange featuring Sarah Pulliam Bailey, Jonathan Merritt, and Trevin Wax. I watched Brandan Robertson’s talk at the Wild Goose Festival on his journey through Moody Bible and evangelical subculture. I finished the day watching Andy Gill’s Skype interview with Peter Enns (which lets you look at Peter close-up for 30 minutes and see his Yankee pennants in the background). There was a lot to process in here. Questions about what constitutes evangelicalism and according to whose criteria (Bebbington had better be getting royalties for each time his quadrilateral gets trotted out). Seeing Jonathan Merritt using John Wesley’s method to explain religious change. Sensing the tensions between tradition as we’ve understood it and contemporary realities (thankfully, no one referenced “slippery slopes”). Issues of scriptural authority, church attendance, and, of course, millennials. Not everyone agreed. But what characterized the discussions was a spirt of grace and compassion. Something that is too often missing in religious discussions. It made me think of the lead male characters in Les Miserables. Jean Valjean’s life is re-formed through an encounter with unwarranted favor. He lives his life to extend that to others at great personal cost. 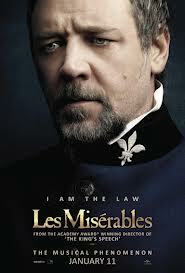 Inspector Javert is committed to the Law. In fact, the superstructure of his mindset is organized around it (check out the lyrics to Stars). There are many versions of what happens to evangelicalism over the next decade or so. Some are optimistic, thinking that pragmatism may win out as it has on other forces of social change in the church. Some are ready to give up evangelicalism as representing a past social form so intertwined with culture wars and political parties that there’s no hope. I tend to see a celebration of gracious faith from all sectors of the Christian church. That means that our old dividing lines may not be meaningful anymore. Dropping labels of evangelical vs. mainline vs. Catholic would be a good place to start. There’s been far too much finger pointing and facile explanation given (I’m amazed at how often we talk of mainline decline or rote ritual even today). We should be offering grace to all those who faithfully strive to follow Christ. It must be admitted that there are Javerts on the progressive side as well. Too many of the comments I read on Facebook and Twitter seem utterly dismissive of traditionalists (who seem utterly dismissive of progressives). Still, if grace is our motto we need to take another look at our practice and open ourselves up to alternative views. A few weeks ago, I watched the movie Einstein and Eddington starring Andy Serkis (not in motion capture) and David Tennant, respectively. Eddington is a physicist who is intrigued with Einstein’s work and sets out to prove the General Theory of Relativity via a solar eclipse. (I ran across a great quote while researching Eddington. An interviewer said that there couldn’t be more than three people who understood Einstein. Eddington replied, “who’s the other one?”). In the movie adaptation, Relativity is a threat because it undermines the whole of Newtonian structure, which was seen as a means of demonstrating order in the universe. This is even related to the gassing of British Troops at Ypres (which the screenwriter asserts, must have happened for a reason). The tension between the advances promoted by Eddington (a Quaker) and the established Newtonian order was fascinating. I thought of this again the other day when reading Randall Balmer’s book on Jimmy Carter. Looking back on Carter’s loss of the White House, Ballmer suggests that Carter could have done more to reach out to establishment evangelicals. He had been given a list of possible cabinet candidates by Pat Robertson that got lost and wasn’t remade. The religion advisor Robert Maddox (a Southern Baptist at the time) came too late in the term. It made me wonder if Carter could have maintained alliances, even though he was more progressive, if he’d found ways of sharing his Christian commonalities with those who went before. In this regard, I’ve been fascinated by the series Peter Enns has been running lately about Biblical Scholars and their “AHA” moments about the Bible. He’s now done six of them (here’s the most recent). In every case, the scholar has great regard for the church of origin and the importance placed on scripture even though questions led each to deep Biblical scholarship. I’m reminded of a book on Culture Wars that Robert Wuthnow wrote in the late 1980s. After looking at the chasm then separating the conservative and mainline (this was problematic even then) he suggests that it was evangelical academics who stood in the gap and could bridge the chasm. They could affirm the heart of the conservatives while offering the insight of the progressives. Perhaps, he suggested, there was a way forward. At the close of his interview with Andy Gill, Pete Enns talked of the importance of humility, both spiritual and academic. It was important to maintain that grace when dealing with the social changes around us. The future of a vibrant Christian faith in this country lies not in battles over orthodoxy or symbols. It is not about who won which political race or court battle. It is about offering the grace necessary to really hear each other, to serve as the midwives who will bring forth whatever next phase of Church the Spirit is birthing.